Yes I know it is Tuesday, but with the Brummel & Brown Thanksgiving post scheduled for yesterday I didn't want to double post. 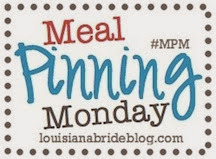 So instead we are a day late and a dollar short:) Better than last week though, I completely forgot to add the Meal Pinning Monday banner to the post! I like to use this Gorden Ramsey recipe form his show The F Word but without the Morel sauce. It is super easy and turns out great every time. And of course my favorite cabbage...but made a little lighter using just a smidge of butter and mostly olive oil. Wednesday: Leftover Lasagna Soup - to save me from cooking on this crazy busy night. Plus Jeremy will be at LSPA and I will be running around like a crazed person getting things done. Thursday: Grilled Chicken with Roasted Brussel Sprouts - no recipe, just seasoned however I feel and the sprouts roasted with salt, pepper, and garlic. Friday: Baked Pasta with Sausage & Spinach -Hosting the Young Minister's Dinner at our house this month. This is one of the best baked pasta dishes I've made recently.